And Receive Instant Peer-To-Peer $25 Commissions! Never before in the history of Network Marketing has there been a business opportunity designed to appeal to every single Network Marketer in the industry! A business opportunity that does not compete with your current business, but instead helps you to promote any business, blog, or website with UNLIMITED Banner Impressions, and receive instant peer-to-peer commissions of $25 at the same time! Every Network Marketer needs targeted advertising, and every Network Marketer wants to make money! When you have something that everyone needs and wants, making money is really easy! Like selling water in the desert! Take a look around this page! Every banner you see belongs to one of our members! The person who referred you to EZ Banner Income has his or her banners permanently anchored in the #1 position for each of the 3 Banner Categories! The rest of the banners belong to other members, and they are randomly displayed throughout the entire network of member websites! When you purchase our Banner Advertising Package for $25 (one-time payment), you will be able to upload 6 banners, and they will be randomly displayed throughout the entire network of EZ Banner websites! There is no limit on the number of banner impressions or hits you can receive. We also track how many impressions, and hits each of your 6 Banners receive! You will be able to change your banners anytime you like. 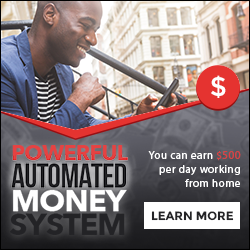 We payout 100% on all sales, and commissions are paid instantly peer-to-peer through a 1UP Pay Plan! So there's no waiting to get paid, and the company never touches your money! For complete details, Click Here to create your Free Tour Taker account, and get access to our Member Center! You Keep The $25 From Your First Sale! No Qualifying Sale Required To Get Paid Infinity Deep At Payline #1! Create Your Free Tour Taker Account Below To Learn How We Reinvented The 1UP! You Pay Nothing Right Now! Favorite Username, and Get Full Access To Our Member Center! PLUS! You Get Our FREE Registration Bonus - Twitter Boom!